Mint Hill Auto Repair – How do I know if I need new brakes? Picture yourself driving down a street, one with a traffic light not too far ahead of you. As you apply the breaks, you realize that you have to press much harder on the pedal than you used to. Sometimes you even have to start applying the brakes hundreds of feet sooner than normally. Has this ever happened to you? If it has, it is time to bring your vehicle in into Manchester Auto and Tire of Mint Hill for a brake inspection. Having to apply brakes sooner or harder than usual is the most common sign its time for a brake job. Of all maintenance the automotive industry considers “preventative maintenance,” brakes are the most important. After all, getting new brakes after a car crash is no use. There are two kinds of brakes used in the modern automobile, “disk” and “drum” brakes. While disk brakes are more common in cars built since the 2000’s, it isn’t uncommon to see vehicles that still have all drums or a mix of drum and disk. The disk brake consists of two key parts: The brake pad, and the brake rotor. The rotor is the actual “disk” part of the brake – it mounts right behind the wheel. The other aspect, the pad, acts as a grabber. It applies itself to the rotor to slow down the vehicle. While these brakes have been engineered to last quite a while, they do eventually wear down from constant grinding that occurs when you apply the brakes. The drum brake works in a similar fashion to the disk, with two key components: The brake drum, and the brake shoe. The drum acts as in a similar fashion to the rotor on disk brakes, it rotates with the wheels. The shoe acts in the same way the pad does on disk brakes. The pad pushes outward against the drum under pressure to stop the vehicle. As with disc brakes, the shoes will eventually wear out and need replacement. A Drum Brake from a 1960’s Ford Mustang. So, how are brakes “fixed?” Once you bring your vehicle into Manchester Auto and Tire of Mint Hill for an inspection, we will determine exactly what your vehicle needs and recommend the required service. If it requires replacement of pads, rotors, or shoes then that service is performed. Sometimes rotors can be “turned” or resurfaced and reused with the new pads but if they have worn past a certain level they need to be replaced. The first step is removal of the wheels. After the car’s wheels are removed, all parts of the brake are accessible by hand. For this car, there are brake discs all around. Our technician will begin the process of disassembling the caliper to remove the pad, and then will remove the rotor. At this point, he’ll measure the amount of usable braking surface left on both pad and rotor, as well as checking for warping or rust. He determines it is time for replacement, and new pads and rotors are ordered. During this time our technician can check and make sure other smaller parts of the braking system, such as springs or hydraulic cables, are also still operable. Upon arrival of the new parts, our technician will reassemble the braking system starting from the rotor and working his way out. The last step is to test drive the car and make absolutely sure the braking system is completely operable, as there can be absolutely no error in something this important. Safety for you and your family is always our main priority at Manchester auto and Tire of Mint Hill. Upon completion of the test drive, the car is deemed completed and returned to the customer. If you need your brakes inspected or repaired, feel free to contact Manchester Auto and Tire of Mint Hill, LLC. at 704-545-5497. Mint Hill Auto Repair – What is a North Carolina vehicle emissions and safety inspection? 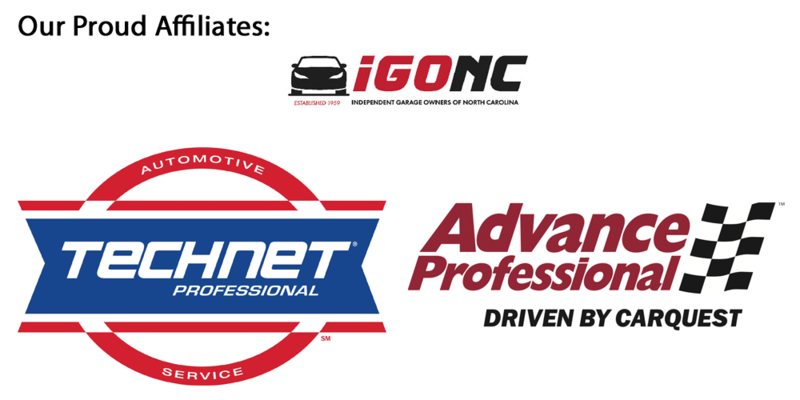 NC State Inspections – Do I Need One? Mint Hill Auto Repair – What is a North Carolina vehicle emissions and safety inspection (otherwise known as a state inspection)? A North Carolina state inspection is a test to make sure vehicles a suitable for the road. There are two types of state inspections; safety only inspections and On Board Diagnostic II (OBDII) Inspections. At Manchester Auto and Tire of Mint Hill we are authorized to perform North Carolina Vehicle Emissions and Safety Inspections. Safety inspections are for cars that were made in model year 1995 or before , or for cars that are only 3 model years old or newer with under 70,000 miles. These inspections make sure that the car is not dangerous to drive and require no plugins or computer software. An OBDII Inspection is a newer style of inspection, ushered in by the Clinton administration, that checks emissions of a vehicle to make sure it is running clean and not over-polluting the environment. These emissions are monitored by a computer (the On Board Diagnostics) and can be read via special software plugged into a vehicle’s ODBII port, usually above the pedals. This inspection is for all vehicles model year 1996 or newer, With the exception of cars falling under the aforementioned 3 Year, 70,000 Mile rule. Do I need a state inspection? Most likely, yes. Most vehicles require a state inspection every year. Vehicles that require a state inspection are due in a certain month, shown via the sticker on the vehicle’s license plate or the registration card. If you are unsure if you need a state inspection, please feel free to stop by Manchester Auto and Tire of Mint Hill and we can determine if your car is due for its annual inspection. Farm registered vehicles (these have farm plates). Why is a state inspection necessary? The largest reason North Carolina requires state inspections is to make sure your vehicle is not over polluting, and is not a hazard to you and other drivers. This helps keep unsafe and polluting cars off the road. However, state inspection monies also go into the Department of Transportation (DOT) funds, which help fund our roads and highways. States without state inspections, such as South Carolina for example, have less money for roads and as a result have older roads that need repaving. A state inspection begins with the inspector pulling the vehicle into the bay. The inspector legally must pull the vehicle in himself or herself, as to feel the brakes as he pulls in to make sure they are safe. This also allows him to check if the Check Engine Light (usually referred to as a Malfunction Indicator light or MIL.) He or she then puts the car into the bay and raises it into the air. The inspector checks to see what type of parts this vehicle has, such as PCV valves. He or she then makes sure all brake lights, headlights, blinkers, and mirrors are in working order. At this point, he or she begins the process of punching in the criteria of the state inspection machine. After putting in info such as Vehicle Identification Number (VIN), tag number, and other bits of info, he or she plugs in the OBDII connector and scans the vehicle. The computer states it passes as the MIL works, but is not on, and all categories of emissions testing are in working order. He or she begins to enter the information of the safety devices he checked earlier. The car passes! At this point, the inspector prints two copies of the passed inspection sheet and signs them both; one for the company records, and one for the customer. He or she then checks out the customer for a total of $30.00 (or $13.60 for safety only inspections) even, as the price is set by the state. The customer pays and everyone is on their way! Once the customer returns home they file for a new sticker for their tag stating they received a state inspection. At this point, the customer is good for one year, and after that year has passed the customer must begin the process again. The entire state inspection can be done in its entirety right here at Manchester Auto and Tire of Mint Hill, NC in an effective and timely matter. Are you due? If you think you may be stop by or give us a call at 704-545-4597. I think my heater core is not working! Oh no! If you are in Mint Hill or the surrounding area and need your auto repaired by qualified professionals, Manchester Auto and Tire of Mint Hill is the place to come. We will have one of our certified technicians run tests on the vehicle to ensure your car is properly diagnosed so you do not end up spending money on unnecessary auto repairs. What is a heater core? A heater core is a device that uses coolant to heat the cabin of the vehicle. The heater core works by having coolant, already hot from the engine, pass through a small radiator (called the heater core), making the core hot. A fan blows the heat generated via the coolant into the cabin, warming the passengers. What are signs my heater core does not work? One of the most obvious is that your car’s heater does not work, but that isn’t the only sign. Sometimes water can leak onto the floor in the passenger side, or the car can fog up the windshield quickly. Sometimes, the car may even smell sweet. What happens when my heater core doesn’t work? Though beneficial when working properly, a broken heater core can be a major disadvantage. Cars without heat are not only unpleasant to drive in the winter, but are less valuable. Since the heated air the core generates cools off as it is blown into the car, the heater core must be located very close to the cabin. Many times, the heater core is located under the radio or by the glove box. Due to it’s positioning, the cabin’s dashboard almost always must be taken apart to remove it. We recently performed a heater core replacement on a 2005 Jeep Grand Cherokee Laredo. The process begins by carefully taking off the dashboard, without damaging the plastic, radio, gauges, or wires. Though time consuming, it is crucial to take time when disassembling the dashboard as to not break any crucial components. Once we have completely taken apart the dash, we can now access to the heater core. At this point you must be careful, as there could be coolant still in the core from previous use. Now with access to the heater core, we remove it. The coolant is drained from the vehicle. We still have to be careful as there can still be some coolant left in the core itself. Next we remove the tubes pumping coolant into the heater core, then unbolt the core itself from the car. A visual inspection of the core usually finds the issue. This one happens to be leaking. Once the old heater core is removed and the new one is set into place, we run some water through the new heater core to make sure it is not defective. If everything checks out OK, it is bolted into place, then the hoses are reattached. Now begins the process of reassembling the dash. We check the electronic database to see exactly how it should be reattached, so we do not rely entirely on memory. From there we carefully attach wires, the radio, the gauges, and so on, putting the car back together again. Now we refill the car with coolant. Turn on the heat in the car to test the new heater core. It works, and the air being blown is warm. Success! If you think you have a heater core problem or need any type of auto repair in Mint Hill, please feel free to stop by Manchester Auto and Tire of Mint Hill and have your car checked out. We are an award winning facility and the top shop for auto repair in Mint Hill. Call us at 704-545-4597 and schedule an appointment today.